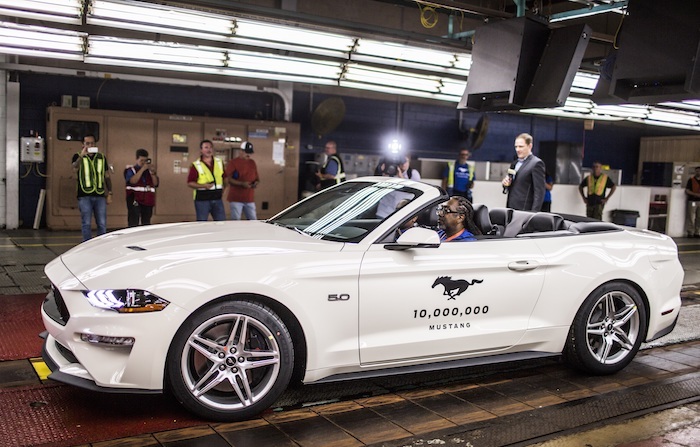 Ford is celebrating the milestone with employee celebrations at its Dearborn headquarters and its Flat Rock Assembly Plant, including flyovers from three WWII-era P-51 Mustang fighter planes and Mustangs produced for more than five decades parading from Dearborn to Flat Rock, where the Mustang currently is manufactured. 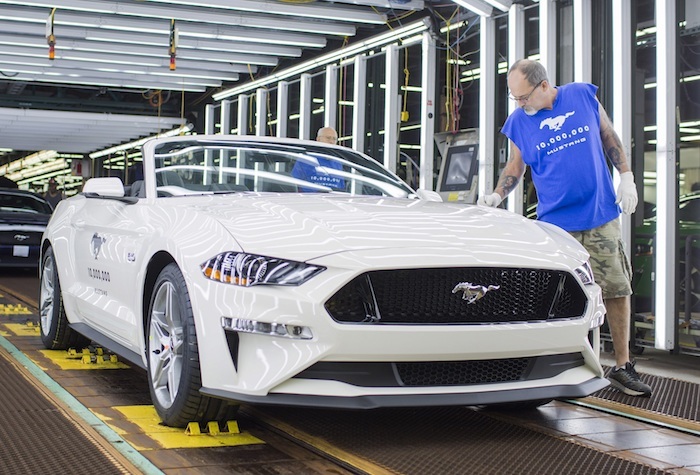 During its 54-year production history, Mustang also was built in San Jose, Calif., Metuchen, N.J., and the original Mustang production facility in Dearborn, Mich. The latest Ford Mustang offers more technology, exhilarating performance and more personalization than ever. The iconic Mustang Bullitt returns for the 2019 model year, with an exclusive 480-horsepower 5.0-liter V8 engine, plus distinctive design and trim. The classic California Special also returns with unique design and trim enhancements. All 5.0-liter V8 2019 Mustangs with manual transmissions offer rev-matching downshifts come to the six-speed Mustang GT, while EcoBoost gets an optional quad-tip fully active exhaust. All-new custom-tuned 1,000-watt B&O PLAY high-performance sound system and available Apple CarPlay compatibility for Ford+Alexa and Waze via SYNC3 will satisfy audiophiles. Mustang Shelby GT350 ascends to a new level of greatness on the track and off with custom-engineered Michelin Pilot Sport Cup 2 tires, plus recalibrated ABS and MagneRide suspension for dramatically improved traction and lateral acceleration. Other highlights include new interior appointments and optional factory-painted stripes. An available tech package includes all-new custom-tuned, high-performance 12-speaker sound from B&O PLAY, plus heated mirrors with Blind Spot Information System and Cobra puddle lamps. The Ford Mustang is now in its sixth generation.